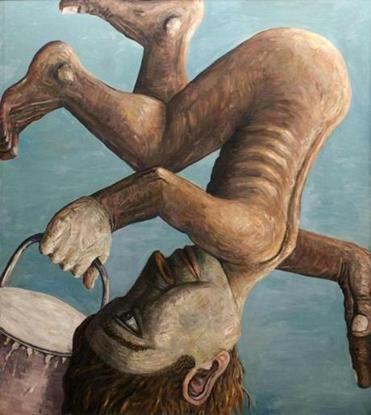 “Upside Down Guy (Falling Painter)” is among the works by Jon Imber that are featured in the exhibit at Queens College. NEW YORK — Good painting pulls at life, like the fingers of a plaintive child tugging at a parent’s sleeve: Come and play! The paintings of Jon Imber have an unusually insistent pull — you feel something vital at stake — which is what makes the career survey of his work in the Godwin-Ternbach Museum at Queens College such a joy. Imber, who lives with his wife, the accomplished painter Jill Hoy, in Somerville, has been a much admired figure in Boston for several decades. Born in 1950, he was a student of Philip Guston, the great postwar painter who made his various shifts between figurative and abstract styles feel as consequential as the shifting of tectonic plates. But Imber has wrestled with different influences, different styles, and different subject matter all his life. The shifts, in his case, have felt less tectonic than nimble, supple, full of yearning and mischief. Life, in Imber’s paintings, unfurls with wayward force, like a thick, flicked rope. It takes on vital cadences. It laughs at itself, too. This is the first survey of Imber’s work I have seen, although there have been others in the past, including “The World as Mirror: Paintings by Jon Imber 1978-1998,” organized at Boston University by Katherine French. The works in it were chosen from Imber’s studio. Evidently the pickings were rich. The location — Queens College — may feel slightly obscure, but the show itself is tight and compelling, and carries the potential of enhancing Imber’s reputation outside of New England, a fate it certainly deserves. The show opens in the midst of a season freighted with difficulty and emotion for Imber and his family. He was diagnosed last year with ALS, or Lou Gehrig’s disease. Although he is still able to paint with one hand (not his natural one), the effort is taxing. When I visited Imber in his studio on the eve of this show, he was animated, as if fueled by the charge of the vibrant paintings all around. He remained all the while on his feet. Both he and Hoy laughed freely, and I was reminded of this in front of a work in the show painted this year. It is a fluid congeries of brush strokes that recalls both Berthe Morisot and de Kooning, whose idea of content in art as a “slipping glimpse” it seems to actualize. It’s called “Bon Temps Rouler.” Let the good times roll. “Flying,” nearby, is painted in what appears to be a very different idiom. Dating to 1998, it shows a naked boy hovering, like an archangel or Superman, over a freely painted northern landscape. What’s remarkable about it is how well Imber manages to knit the huge, unlikely figure, magnified by proximity, into the vast, vibrating space around it. This sort of thing is not easy to do. But with one eye on the Venetian painters of the Renaissance and one, perhaps, on Guston’s early mural work, Imber pulls it off deftly. It is tempting to say that for years, Imber has been alternating between an abstracted style influenced by de Kooning on the one hand and, on the other, a penchant for huge, volumetric figures that have an inflated look, recalling late Guston, or Picasso’s chunky neoclassical period. But “Flying” is one of a number of paintings here suggesting that, for Imber, it has never been “either/or.” Get up close to sober, densely worked figure paintings like the marvelous “Memory (Father and Son),” or “Portrait of Harold Imber,” and you see how thickly layered the brush strokes are, how boldly combined the colors. It’s like looking at an extra-dense-weave Jackson Pollock. The results, when you step back again, are impressively tight: These works ride the wall with almost intimidating authority. 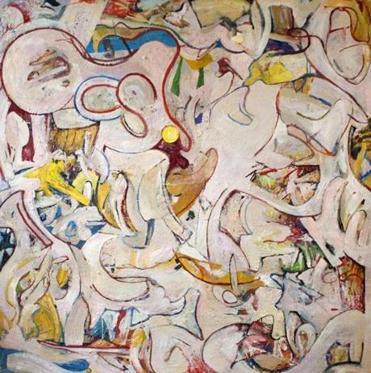 Similarly, in ostensibly abstract paintings such as the bravura “Lantern in the Snow” or the de Kooning homage, “My Attic (Early in the Spring),” figurative elements push forth and recede like cresting waves at sea. The 2005 abstract painting “Palaemon,” for which the show was named, is a small wonder. Palaemon was a minor Greek god, often depicted riding a dolphin, who fell into the sea when his mother, holding him in her arms, threw herself off a cliff. At first glance a composition more of shapes than of lines, it’s nonetheless peppered with arabesques and zigzags, layerings and erasures, the whole thing at once heavily worked and strangely accidental, like an excavated treasure. Many of Imber’s paintings successfully occupy an in-between zone. “The Nap” combines close-up figures with a spacious landscape. It is full of romance and mystery. Like many other figure paintings here, including the small-scale “Armillary” and “Sacrosanctus Vetustas (Gabe),” it makes great play with foreshortening — with the challenge of painting figures that appear either to pull forward out of the picture plane or to recede back into it. Working out how to do this without pulling apart figure and ground entirely — without, in other words, ending up with two separate pictures awkwardly spliced together — is a game Imber has clearly relished over the years. White-knuckling a can of paint, a naked figure, who once again calls to mind Palaemon, tumbles downward against an empty blue sky. The falling painter, rounded but with ribs and anklebones rudely protruding, is framed tightly by the edges of the canvas — so tightly that his hair is cropped at the bottom, while one of his feet seems to stand on the painting’s top edge. Clunky and gauche at first sight, it’s in fact a virtuosic painting that sears itself into your mind.